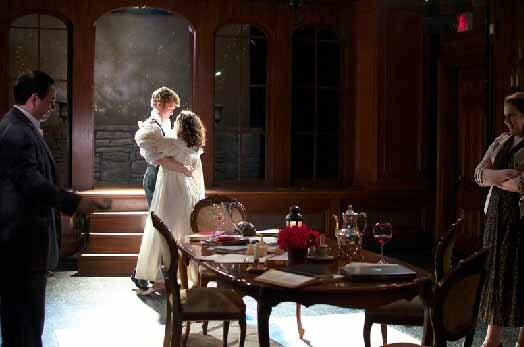 'Arcadia' at New Leaf, the company's last production. 2. The University of Chicago 2012 Edes Prize goes to David Brent and Jack Mayer, the minds behind the previously profiled superhero show and the semi-regular live movie events. "...with the Edes Prize to back them, Mayer and Brent can now think in terms of weeks-long runs, extending into in full three-show seasons, thereby allowing the individual works to grow and mature, and just as importantly, giving press and word of mouth the opportunity to help the artists build something repeatable and sustainable." They also get $30,000 which is enough money to basically make live movies for the rest of one&apos;s life, right guys? 3. I would be remiss if I didn&apos;t include Schadenfreude&apos;s NATO Loves You show this weekend, and by that I mean, my boss would give me a hard time for not promoting his weekend activities. 4. As the gossip mill indicated, New Leaf Theatre is no more, though it&apos;s slightly unclear as to why. The jist seems to be: the theater was fun, the admin work, not so much. "[I]in conversations beginning last year...they began to come to the consensus that their self-managed administrative model was unsustainable," reports Kris Vire in an exit interview with the founders. Also, there&apos;s grad school to be gone to and kids to be had. "I want to assure you that this decision was reached over a long period of time and was not the result of a calamity," wrote managing director Eleanor Hyde on the New Leaf Blog. "We are not bankrupt, we are not imploding or exploding, we hope to work together in the future." Their last production, Arcadia directed by Jess Hutchinson, closes June 16. 5. The Joffrey Ballet will now be accompanied by the Chicago Philharmonic for all performances, collaboration that can probably be described as "pretty exciting". "Working with the Chicago Philharmonic will enable the Joffrey to perform to live music at all four of our Chicago season programs, something that wasn&apos;t always feasible in the past due to budgetary restrictions," said Executive Director Christopher Clinton Conway in a statement.